Although much of Arizona stays sunny and dry for most of the year, winter weather can bring colder temperatures and even frost, especially at night. When this happens, most homeowners pack up their gorgeous backyards and cozy up inside. However, you spend time, energy and money to maintain your beautifully landscaped backyard. Winter weather shouldn’t stop you from enjoying the outdoors or entertaining your guests in it! Here are some ways you can improve the look and feel of your backyard while keeping yourself and your guests warm. Fire pits are commonly considered a summertime activity—a functional tool you can use to roast hot dogs and smores and a cozy seating area to relax around with friends and family on a calm summer evening. But fire pits can get lots of use throughout wintertime, as well. Adding a fire pit to your backyard is a cost-effective and fun way to heat up your entertainment space. Some fire pits can burn traditional wood, while others are fed by propane or other gases. They’re also extremely customizable. You can build a simple fire pit yourself from brick or stone, or hire a landscaper to install a custom-designed pit just for your yard. They can be built into the ground, raised or even crafted in the center of an intricate seating area. 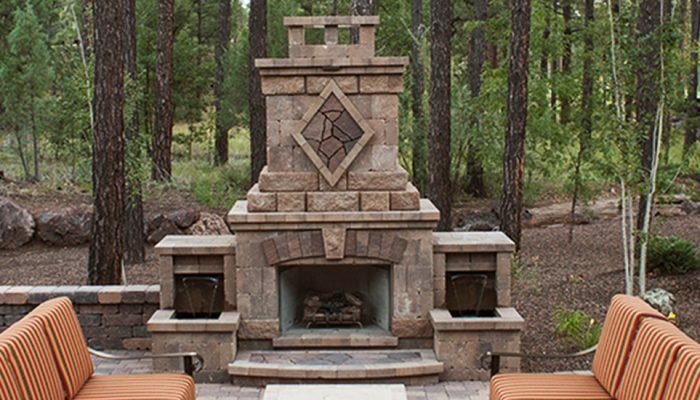 Another great option for warm outdoor entertainment is an outdoor fireplace in Show Low, AZ. Most people love cozying up in front of a fireplace inside, so imagine just how lovely it would be to curl up in front of a warm fireplace underneath the stars! Outdoor fireplaces are typically added to a seating area and create a wonderful focal point for the patio. Like fire pits, they can be constructed in a wide variety of materials and created in any number of custom designs, so you can add something that truly fits with the aesthetic of your backyard. Outdoor fireplaces are best accented by a patio table, chairs and comfy outdoor couches. Keep a few soft blankets, pillows and extra cushions around to take the comfort level to the maximum. Features like fire pits and outdoor fireplaces are almost always permanent, which means they should be built to withstand the tests of time and hold up against inclement weather. These types of additions can not only boost your comfort and improve your guests’ experiences, but it can also enhance the value of your home. For all of these reasons, installing a fire pit or fireplace is a great idea for homeowners looking to take their backyard to the next level this winter. However, installing a hardscape feature like an outdoor fireplace in Show Low, AZ isn’t easily done on your own. It takes the right combination of expertise, creativity and experience to create a truly remarkable outdoor heating element. For the best possible outcome, call Tim’s Landscape Creations. We offer numerous services to transform your outdoor areas, from walkway and patio creation to retaining wall or fire pit installation. We also use the best quality materials and top-notch, experienced professionals so you know your backyard is in good hands.